This is the documentation page of the Awaken Pro WordPress Theme. We will try to keep everything well documented. If you are not sure about particular area of this please contact us. Use Choose File button to select the awaken-pro.zip file. Select the theme ‘awaken-pro.zip’ file from your computer and click Install Now Button. Then please navigate to “Dashboard > Settings > Awaken Pro Theme Activation” to enter your API key and API email. After entering the details hit the “Save Changes” button. Click “Save Options” button in the bottom of the General Tab. Layout options of the Awaken Pro WordPress theme exists in Appearance > Customize > Layout Options. Select your preferred layout from the dropdown. After creating the boxed layout you may want to change the background color or background image of the site. (background means the area outside the content area) To change the background color go to Appearance > Customize > Site Styling > Site Main Colors > Background Color. To change the background image go to Appearance > Customize > Site Styling > Background Image. Slider can be activated in 2 ways in ‘Awaken Pro’. First one is slider based on the category. 1. Go to Customizer > Homepage Settings > Featured Slider. 2. Mark the ‘Display slider on homepage ?’ check box. 3. Put number of slides you want in ‘Number of slides’ input area. 4. Then select the category of posts which you want to display in the slider. ( Featured images of posts of the selected category will be displayed as slider images. Second one is custom slider. Activate(select on button) the custom slider from Customizer > Homepage Settings > Custom Slider. Then add images, titles and urls. – Slide image width MUST be 752px and height MUST be 440px or must be propotional to that ratio(eg: width: 1504px, height: 880px; ) in order to display the slides properly. – Regenerate thumbnail plugin does “not” crop the images when you are using custom slider. You have to use photo editing software to crop images manually. There are 9 widgets that you can display in the magazine template. 4. Awaken Sidebar Posts Widget. 5. Awaken Popular Posts, Comments, Tags Widget. 6. Awaken 300×250 Ad Widget. 7. Awaken Responisive 728×90 Ad Widget. 8. Awaken Youtube video Widget. I have Awaken Pro purchased and had been using it for a few years. Currently, I have it installed in two different languages (Asian language and English) with two different domain/subdomain. I recently discovered that the arrow on the menu items at the Asian language one became a “square”. The English menu still looks fine with an arrow for the items that has submenu. Could you please advise? thank you! Could you please send me the url? It seems you haven’t created a magazine homepage as described in section 5 ( 5. Magazine Homepage ) of the documentation. After making a magazine homepage your widgets will display as shown in the demo. Yes, you can do that via translation. You can do that manually or by using a plugin. Plugin way is easier. I recommend Loco Translate plugin to change default theme English text to German. Yes, you can change the article link color from Appearance > Customize > Site Styling > Site Main Colors > Article Link Color. I realized the purchase of the theme awaken Pro in August 2017, and currently I use the 2.1.8 version. I am unable to update the theme through the site. How can I do that? I’m waiting for a comeback. I have sent updating instruction to your email. I changed this Awaken them to magazine style exactly like you did it here in the post. Now I have this three block posts widget and single posts widget on my site. Its all fine, but when I click on the next page in those widgets, there are posts with blank pictures. I have a pro version and I simply don’t understand why is that so! Are you using any lazy loading plugin? If so deactivate it and try it again. Please let me know the results. I’m using Loco Translate, but not only it shows that there’s no template to link the translation from, but also when I try to skip the template and go for source code the plugin only finds 7 terms. Could you help me with this, please? Thank you. I am sorry I have mistakenly skipped this question. You can change that from Dashboard > Appearance > Customize > General Settings > “Footer Copyright Text”. And we support our premium customers via email directly. Please contact us if you have any problem. First of all really nice theme, Secondly if i buy pro version then with how many websites can i use this theme?? You can use it on any number of domains/websites those belong to you. (Domains registered under your name). Hello, we are having trouble adding our custom logo. We’ve followed the directions but it always says ‘setting does not exist or is not recognized’. Can you help? It seems you are still using Awaken Pro 1.0.2. Current version is 2.1.7. I recommend you to update your theme. And please read the documentation notice before update the theme. I have issue with slider on my front page. Its working but whenever its in transition slides changed and then its white. Did you experience this issue? It seems your site is in maintenance mode. Could you please let me know when it is removed? hi, it’s an awesome theme. just one quick asking: I am using magazine template. is it possible to make the heading link-able to the specific menu. for example: if I have a heading like ‘history’ to show the post under history category, it now shows any specific number of posts , which is fine for homepage. But the title ‘history’ it self is not clickable. Means the rest of the posts of this category are not showing. And readers needs to go through via menu for more posts of that specified title. but I want the reader to click the heading ‘history’ to go to that specific menu to show all of the post under this label. In pro version all the widgets have an square icon to link to all posts of the specific category which the widget is displaying. However I like your idea. I will consider it giving in a next update. 1) The left (“) arrow logos on the slider site was changed into strange symbol, after I installed it in 4 days. 2) That was the same condition the logos on Menu (please see it to http://www.multiplesclerosis.or.id). The drop-down icon doesn’t appear though the link is connected. 3) The link to our social media platform doesn’t show the logo i.e. Facebook logo. Instead, it appeared as “Share on facebook” not a logo, the same appearance on other social media platform: Instagram, Pinterest, Twitter and Linked in. Greatly appreciate if you could response to my queries above at the soonest. Thank you. You can do that with custom css. Please go to appearance > customize > site styling > custom css. Then copy and paste the following code. Change font size to any px size you want and change the font-weight property to “bold” or “normal”. Thanks for all the help and the great Template! I have a question about the social media icons. I would like to add two new icons (Tumblr and 500px). While I can do some coding, but I’m not sure about the CSS code I found in the editor. If you could either add that code, point me to a tutorial about this, or just give me the specific keyword I need to Goggle to find it on my own, that would be fantastic. I can come up with the icons. Thanks again for all your help. I will give those two icons in the very next theme update. Sure I can help you. I will list the steps below. First go to Dashboard > Appearance > Menus. 1) If you haven’t created a menu yet create one. To create a menu click the “create a new menu” link. Then give it an any name you want. ( Eg: Main Menu ) Then click the create menu button. I recently purchased this theme through my brother who has a funded Paypal account. I need to be able to display widget sidebars on categories menu. This is my website link http://www.latestworldinfo.com so you can know that I purchased it really. Do you need to display a menu on sidebar? If so it is very simple. You can put WordPress default “Custom Menu” widget in any sidebar. I need some help. I purchased the pro Awaken theme and am struggling with a few things. I am really hoping you can readily help me. I am using a temporary domain. 1) In the magazine 1 area I select the “Awaken: Three Block Posts” but the only thing that appears there are predetermined blog posts – how can I specify content for these three specific areas? 2) I am not sure how to link new pages I create to the navigation bar. 3) Where do I add code for adsense? I replied you via email. I think you got it. I have replied to your question via email at the same day when you asked the question. Just replying this to inform you about this. Please let me know whether you got the mails or not. How can I put code into home page? If you are using magazine template for homepage, you need to edit layouts/magazine.php file. If you are using blog posts page for your homepage you need to edit index.php. Installed this theme and configured home and blog pages but magazine widgets arent shown, why? 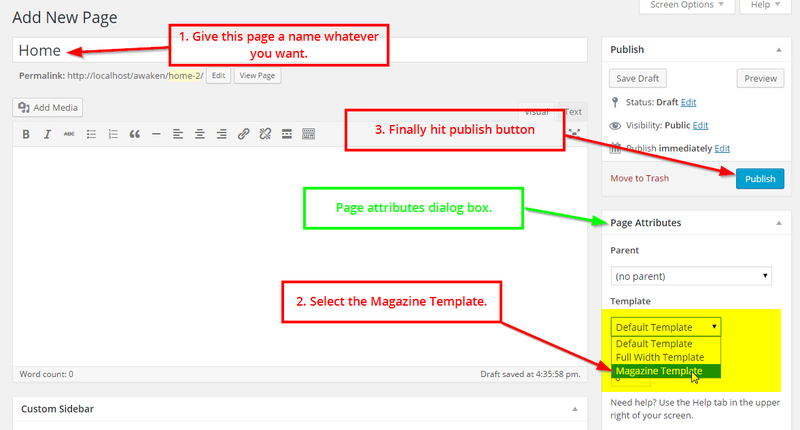 Did you create a magazine home page as described in the step 5. of the documentation? Thank You for buying Pro. I’m just trying out the awaken, so far it works great for desktop version, but for mobile version the menu just fully open, and when i tap the head categories, the branches won’t pull up, you understand what i’m saying right? sorry i just can’t describe it well. Theme is developed to display long list menu. It will display all the menu items. Submenu items will be indented. However I am going to provide a better mobile menu solution in a near update. Of course. That’s makes total sense. Thank you for the response. How do I remove social icons from the social icon post/page when I’m not utilizing them? I left fields blank for linkedin, google plus and pinterest but they still show up on the page. Also, is there no icon for Intsagram? Please note that those icons for sharing your posts. It does not matter whether you have accounts on those networks or not, but site viewers can share your posts in their preferred network. So it is better to keep them as it is. There is no instagram icon because instagram is a photo sharing network. I seem to be having trouble with some spacing issues. How do I move my footer area on my home page up closer to the content? It seems your facebook widget takes more height than it should. Please go to facebook widget and adjust the height. I have a problem with displaying thumbnails in different categories when clicking at right, on the arrow to go to the next page. The thumbnail images does not appear on page 2,3, etc…. It seems the lazy load plugin is the reason for this issue. Please deactivate the lazy load plugin and try again. I’m currently building a website with your awesome theme, but there are a few things which I want to modify. 1. Is it possible to make the images in the slider clickable? Currently, it’s just the text/title which leads to the post/site. 2. I don’t want the featured image to be visible in the actually posts but still on the frontpage. How can I hide them in the posts? 1. Yes we can do this. I will provide you a child theme to do this. is not working. can you please help regarding that? I can see it is working on your site. Did you find it why it has not showed up? How can I remove top navigation menu? Don’t assign anything to top menu. 1) Don’t select any menu to top menu. 2) Un-mark “Display social icons?” in Appearance > Customize > Social Media. That way you can remove top bar. I like your theme, it’s perfect, easily customizable but I would need some advises to go to an advanced customization. I’d like to know how to add a a:hover on the images of the main slider and how to synchronize the a:hover of the titles and the images (afp-thumbnail + afp-title and awaken-featured-slider + awaken-title-slider). Could you help me please, it would be really helpful! How can I center the site logo? The site logo is very small on mobile devices but normal size on desktop, is there any way to increase the size of the site logo section for mobile? Could you please give me your url? I will check it and send you a css code to edit that. Thanks for responding. Can I email it to you? Of course you can mail me. I have bought it for my multisite wordpress (WPMU), but it doesn’t work after active it in main site or children site. And how can I embed a twitter post like an article in magazine 2? 2. Then copy the url of the tweet. 3. Then paste the url of the tweet in your posts editor where you want to appear your tweet. In just few seconds it will display the tweet. Can I somehow make the footer act only as 1 single column? Do you mean the footer widget area? I installed the awaken pro theme, but I have some problem. I add in the widget magazine 1, 2 and the others like in the demo, but I don’t visualize the areas (magazine 1 and 2) and the our stickers/labels. I want area magazine 1, 2 and sidebar exactly like in demo. 1) my customer would like me to remove the ‘page titles’ that appear in colored backgrounds. For example, there is a green tab on the home page that says ‘home page.’ (I changed the color from the original red). 2) I can’t get my home page to show full width. I’ve removed the widget areas from the CSS, but it still won’t go full width. Any suggestions? To change the page to full width you can use the full width template for home page. From page attributes dialog box of page edit screen, change the template to full-width template. And to remove the title you can use the following code in the custom css area. I have the awaken pro version, and I created a magazine template page for my home page but when I want to use the widgets category post, I can’t select any post category ( this is the same problem for single, two or three category ). What should I do to fix this ? I love Awaken Pro! We’ve been using it as the main theme for our website (littlegreendog.com) since our launch last March. Your theme looks great and continues to work flawlessly for us even after the recent WordPress updates. I have a question. We are currently using version 2.0.2, and today I noticed the 2.0.5 update in my account. I’m thinking of updating our theme but I was wondering what the improvements are in 2.0.5 and if there is anything I should be concerned about before installing it. And sure I will list them here. Following are the main changes. However I can say there are no security updates so that you don’t have to update your theme in a hurry. Can I add full posts to the home page (display the whole content of a post)? You can display a full page as the home page. 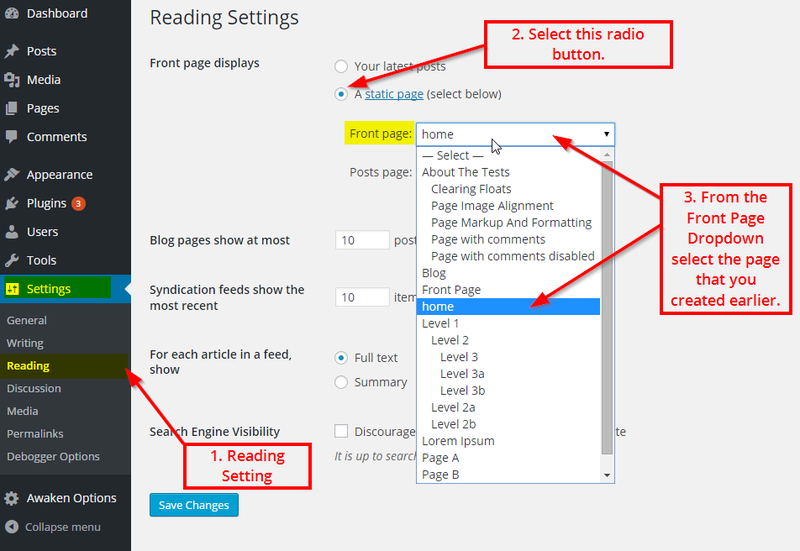 What you need to do is, create a page and set your particular page as the front page from Reading Settings. That page should have set to default or full width tempate from the page edit screen. How do you add a page that displays only posts with a certain tag, similar to https://themezhut.com/demo/awaken-pro/category/sports/? It’s very easy. When you write posts assign them into categories. Then display those categories on the main menu for easy access. – allthough I’ve added anew 5th category in the post – and checked it being on the list of categories?? The new category should display on widgets. There is no limitation on number of categories. Did you refresh the widget page? Hola, Pubudu, tengo un problema con la imagenes de mi sitio http://www.crsantaluciadealsacia.org : ellas no cargan en el frond end, sóloo aparce el nombre o código por ejemplo : proyec_acceso1-1	o banner_copropie. Qué será lo que está pasando? Cómo debo solucionar este problema. Por favor, ayuda urgente. Hello, Pubudu, I have a problem with the images of my site http://www.crsantaluciadealsacia.org : they do not load on the frond end, sóloo aparce the name or code eg proyec_acceso1-1 or banner_copropie. Out what’s going on? How do I fix this problem. Please urgent help. It seems your server is taking too long time to load images with a 504 error. Please ask your hosting provider what’s going on. I am sorry I cannot do anything regarding this matter. Where is the .zip file for the pro version. So far you are a company that takes people’s details and do not deliver product. After the purchase you should normally redirect to the downloads page. And a automated email sends to your email inbox. And you can download your product and product updates always from https://themezhut.com/my-account/. By all those three methods you can download your theme. Thank you Pubudu. There was no redirect and the email receipt only had information to contact you about content delivery. I was able to find the link through my account however. I do recommend purchasing this theme as it is well built and Pubudu’s customer service is excellent. first of all, I congratulate you for your theme. Nice work. I would like to insert an ad banner in the top pages, but i can’t find the option to do that. Could you explain me? I’ve noticed. When I use the magazine template frontpage (static), the page is not updating when I make a new post. Any ideas what could be causing this? I’m using W3 Cache and the Awaken Pro Theme. The site is http://www.miamivalleyveteransmuseum.com. I’ve tried clearing everything from the browser caches to temporary files on the computer and deactivating the caching on the site. Still no change. If you are signed in though, the page will show the updates. Most probably this is because of the cache plugin. Don’t deactivate it. Please activate it and delete the cache of it and see whether the posts are showing. I have done that several times. Still would not update. I think I found the solution. I changed the reading settings away from a static front page, cleared the cache, and then reverted it back to a static homepage. As of now, everything is updating again as it should. I have the awaken pro theme and recently it just stopped displaying the slider. How do i fix that? It is because your site is not reading the jQuery file. One of your plugin may have de-queued it or has a conflict with it. First of all if you are using any cache plugin please empty the cache and see if it is working. If you can remember the last plugin you installed please uninstall it and check whether it’s working. Or if you can remember the last change you made that made it not working please undo it. Please reply to support@themezhut.com if you couldn’t resolve it. I’ll help you. Just add the video url to the post editor and mark that post as a video post type post. Hello Pubudu, i have problem with header banner. I want to fix a banner to Header Ad Area . My image link is following scroll. How can i fix banner to header area? You can use Awaken 728×90 Ad Widget in the “Header Ad Area”to display a header banner. How come I see ‘No Image’ and ‘No thumbnail Available’ where my image should be? Please use the regenerate thumbnail plugin once to optimize all of your images. Hi can i have child Theme Please Thx. my logo of the site, on cellphones, is reduced in half the space available (photo illustration). The logo is OK on desktops and tablets. But on cellphone, is reduced. There’s something I forgot to set up? I checked on several devices and I couldn’t find such a huge gap. However please paste the following code in the Custom CSS code area in the customizer and save. And please let me know if this worked. I’d like to use a sidebar widget for “Popular posts” only (like you have here: https://themezhut.com/demo/awaken-pro/). But I can’t find this option. I only find the option for “Popular/Comments/Tags”. How can I change it? Please read our documentation to learn how to setup the site. Following are the list of image sizes. But you don’t have to make exact image sizes. Regenerate thumbnail plugin will crop all the images to fit following image sizes. Hice una consulta sobre la traducción al español y no he recibido respuesta. Por qué? Acaso no existe soporte para el tema? La consulta fue que traduje el tema al español y lo subí al sitio pero no funcionó. Me quieren decir porqué? I made a consultation on the translation into Spanish and I have not received a response. Why? Perhaps there is no support for the subject? The consultation was that the subject translated to Spanish and went to the site but did not work. I mean why? I am extremely sorry for the late. I replied you via email. Please check it. Podrías enviarme de nuevo el correo? You could send back the mail? Is there an easy way to modify the CSS settings for headings (eg. , , etc) within the theme, or do we simply modify the CSS directly? There is not settings to do that directly from customizer. However you can directly write your modified css on Custom CSS Code area in the customizer. edit and remove the footer text. Please go to Appearance > Customize > General Settings > Footer Copyright text. You can edit the footer text from there. I want to remove and edit footer text, how I edit this. My website is not a static page but a latest post, is it possible to put separators between each post, I will love that each post is framed. Is it possible? Thanks for your help, promise this is my last request but it is essential. last question, usefull this time, is it possible to change site’s title font ? You can change the Heading Font but not the title font. I am sorry currently this is not possible directly from the Options Panel. But I will give the Awaken Pro 2.0 main update within this week. After that you will be able to do that. However for now if you want to choose a font that you have already chosen for other elements ( body or heading ) you can use that font for the site title. Just paste the following code in the custom css code area in the options panel. Use your preferred font instead of “Ubuntu”. Hello, im in the pro version. Is it possible to change the color’s background menu ? The menu is actually in grey/black and i want to change it in white. I have bought and installed awaken pro theme on my site. I have created the slider as you could see on the homepage, but I want it to take the full width of the page and show the latest posts under the slider as 3 columns layout. Could you please help me with that ? Hello, I need help. I had Awaken basic installed on my site (WordPress), I just bought the pro version and I need help to activate it. Can someone please help me? I will fix this in a theme update. However for now please paste the following css code in the Custom CSS Code area in the Awaken Options Panel. After pasting hit save. Yes that is possible. Just go to Appearance > Menus and put categories in to your menu from the left categories section. Then drag and drop them under blog menu. Hit save. Then you are good to go. need your support once more. 2) a arrow, for page (next page) = this one is not working. Once you click it, the widget fades and the loading animations shows, but after they disappear and nothing happens (no paging). Could you please give me your url to check? In my end I can see it’s working properly. Tried using two different browsers firefox and chrome. 1.I have problem with size of some images in feature posts: http://i.imgur.com/cB8BUnz.jpg What should i do to fix this? 2.How to choice which post i want to be added on Featured Posts and Slider? 3.How to make clickable (images are not clickable right now) posts of Featured Posts and Slider? I also sent you email about those questions. I will answer all the questions in the same order that you have asked..
2. You can create a specific category only for slider. For example if you make a category called “Featured”, you can add posts to that category and then choose this category as the slider category. That way you can choose what posts you want to include in slider. And if you want you can make a custom slider linking to relevant posts. To create a custom slider use the custom slider feature. ( Awaken Options > Home Settings > Custom Slider ). 3. 4. And for the third and fourth questions I will send you a Child theme which works in the that way. Thank you very much, 1, 2, 3 is done, can you help me with 4th question ” 4.How can i disable Featured Posts and Slider for 2 / 3 / 4 … pages?” If i need to use your child theme, please email it to me and let me know how to fix it, Thanks very much for your help! I have sent the child theme to your email. Last question, how can i disable Featured Posts and Slider for page 2 / 3 / 4….. I need to let it active on home page only. I will reply you via email. And I hope you have got the child theme also which I sent you on 20th Oct.
Chiedo scusa anticipatamente, scrivo in italiano perchè non ho troppa dimestichezza con l’inglese. Ho risvegliato il thema awaken pro, faccio i complimenti perchè è favoloso. Ho notato una cosa io non ricevo gli aggiornamenti e sono fermo ancora alla versione 1.0.0. Oltre questo da qualche giorno la Main Sidebar dei post. non sempre mi compare a destra ma capita che esce sotto. come posso risolvere ? grazie anticipatamente. Mi dispiace per il ritardo di risposta. È possibile ottenere tutti gli aggiornamenti da https://themezhut.com/my-account . Il processo di installazione di aggiornamento è manuale , per ora . Ma noi implementare un sistema per ricevere automaticamente gli aggiornamenti . Daremo questa funzione entro pochi giorni . Fino a che si prega di aggiornare manualmente . La prego di spiegare che cosa è la questione sidebar ? Ti ho risposto via e-mail . Si prega di avere aspetto e risposta. IN addition to that, when I select to see all the post from a certain category, the word “CATEGORY” appears before the name of the category in the section tab. Can it be translated (to portuguese) or removed all together? Yes you can translate the theme very easily. I will reply you via email how to do it. Hi, would you have any news about this? Our site is close to launch and I’d like to go live with this fix. I have sent you the instructions 4 days ago to your email “ricardo.abellan@gmail.com”. If you cannot find it, please check in the spam folder also. It seems you have activated the redux framework demo mode. Please go to plugins page ( Dashboard > Plugins ) and click the “Deactivate demo mode” link in the redux framework pluginn. Hello Pubudu, i have problem with header banner. I tried to add a banner to Header Ad Area in Customizing/Widget settings. My image link http://supskv.cz/wp-content/uploads/2015/10/banner_728x90.jpg is working but page header is still empty. Whats wrong? Please delete the title name “Test title” and hit save in 728×90 ad widget. hi, i want to question. whether this theme has HTML 5? thanks. Yes it has HTML 5. I just purchased the pro theme. I recently noticed that the images within the slider are not linked to the article and only the title/text of the post is a link to the article. Is it possible to make the images themselves links as well? Yes it is possible. I will send you a child theme which works in that way, as soon as possible. I have a problem… how can I reach out to you ? I wanna show the problem that Main slider has a problem. I mailed you. Please reply to that. Hi, I’m facing the same issues regarding the translation of the phrases: “YOU MAY LIKE THESE POSTS”, “Leave a comment “, “Find us on Instagram” and etc it was in my language (Portuguese). How can I change them? It’s really great this theme! Congrats! It would be fantastic if we could write what we want to show on. In my layout, I want to increase the “post area”, making the sidebar smaller. How can I do that? It’s possible? And It’s possible to put the slider in a page? Or just in the front page? In a future upgrade, could you insert a Pinterest Button on Social Media? If I have some question, I’ll return to write you! If I try and add posts to magazine 1 or 2 like you’ve shown above….it doesn’t do anything. All my blog posts are just listed. I can’t section them off like you’ve done above and in your demo. Could you direct me and tell me what I might be doing wrong? Hey. How do I make my site responsive? Are you using awaken pro? It is responsive by default. It get a corner label on every article you create with the category. It is not a plugin you have to customize the post content to have it like that. You have to change the code. I was installing the pro version on my site, but now I see that the top menu and the main menu has a rectangular line. How I remove the rectangular border? Can you check in chilenext.com please? Thanks an advance!! It seems you have activated the redux framework “Demo” mode. Go to plugins > installed plugins > Redux framework and press “Deactivate Demo Mode” link. Note: don’t deactivate the plugin. Just deactivate the “demo mode” only. Hello. I installed the theme on my site. The problem I face is I have a static page, and I want to show that page as static. But the blog page which is in menu navigation with heading: “Nachrichten” doesn’t show blog posts anymore since theme change from a Genesis to Awaken. I also applied Magazine template. It should start showing. What am I doing wrong here? Hi Pubudu, How view Awaken theme on a phone/tablet with a same format that I see on the computer ? Thanks! It’s made to be responsive. That means it adjusts it’s layout to the particular screen. But don’t worry that doesn’t hide your content. Yes It’s OK Now, Thanks, another question, Can I see the website in a phone or tablet with the same format that I see on a pc? I bought Awake pro but can not find “awake folder option” in the dashboard, why that happen? And Last q, main sidebar doesn’t work, what do I do wrong? I can see it is working. But please make sure your images has a minimum width of 752px and a minimum height of 440px in order to work it properly. If your images are larger than that please use regenerate thumbnail plugin to crop. But if your images are smaller than that slider will not display it properly. In this case your image that you have used for “ппопоп” post, has a lower height than 440px. How to set up this theme, I want the ame exact copy of yours, but when I put a post in magazine 1 and then in magazine 2, post is not showed in the seconde widjet area only in fist one, how to do that? It seems now your blog page has been displayed as the homepage. And seems you have selected the no sidebar option for it from the page that you have chosen for blog. If you slowly go through the images of the “5. Magazine Homepage” section of the documentation you will be able to setup your homepage as shown. If you cannot find or seem it is difficult please contact us via support@themezhut.com. I will setup your site for you. Hi, could you please help me: I have Awaken pro and need to have ads on post pages inside, before and after the posts (not in the sidebars), and need the same on the pages as well. What can I do for this? Is it possible? I only see Magazine 1, 2, the sidebars and the Header ad. You can use a Adsense ads plugin for that. There are plenty in the plugins directory.